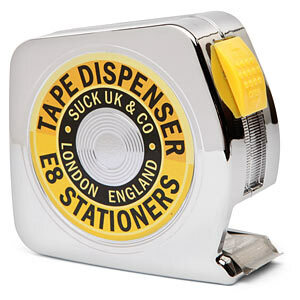 Sticky Tape Dispenser. Plumbers, electricians ... need tape or duct tape for their work. Also hang on your belt. To develop certain jobs such as plumber, electrician, carpenter or even as a clerk in a gift shop, you need the right tools and always at hand. Well now with this dispenser tape or duct tape you have it on hand, either at your desk or on your belt and is available whenever you need it. Tape dispenser measures: 8 cm x 4.5 cm.